The industry has been pretty vocal over the last few years about how the gaming economy is slowing down and it only takes a cursory glance at the bankrupt studios and the number of gaming media closures over the last few years to see that they aren’t just making this up. But last year saw the release of two new consoles and there was a lot of hope that this would signal a turn around for the industry and that we could be heading back to better days. Well in the UK at least this seems to be proving to be correct with the gaming industry in the UK growing by a solid 20% over the past financial year. Locally our industry is still struggling but the upcoming release of the Xbox One and the expected increase in PS4 games after June are expected to help us locally as well. But let’s take a look at how that extra 20% has helped the UK industry and where the GBP3.48B pounds gets spent. As you can see the boxed retail versions of games is still the largest part of the industry but it is still dropping and is now virtually equal to the digital sales which increased by 25% over the last year. The 78 million in used sales does make us question how bad that section is for the industry but what really depresses me to be honest is the mobile gaming section. That has increased 83% year on year and is now worth a whopping GBP430 million alone. 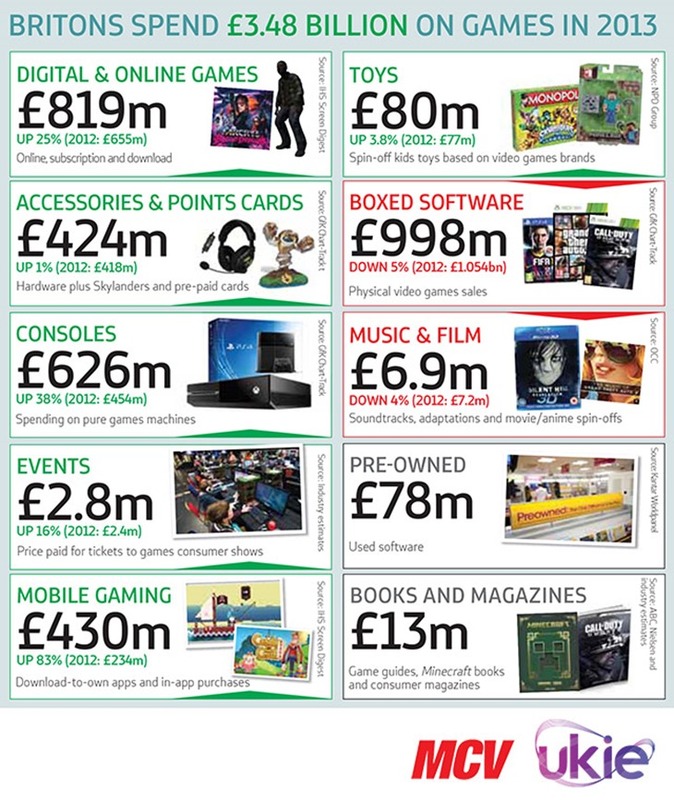 Surprisingly the video game toy market is only valued at GBP80 million, I expected that to be much higher but maybe they don’t count Skylanders and Disney Infinity as toys? I would hesitate to say our local breakdown is probably close but the retail box set side is likely still quite a bit larger than digital thanks to our slow Internet. I do expect this to change. 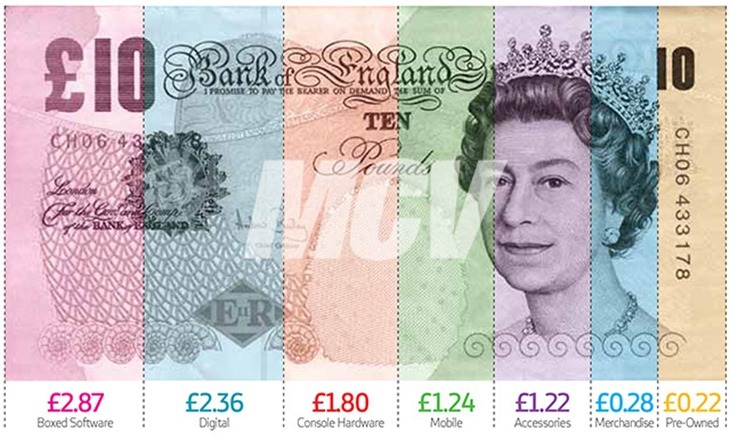 My favourite breakdown however is the following visualisation of how every 10 pounds spent in gaming is broken down. The only thing we are missing is how much of that Boxed+Digital sales are related to consoles compared to PC’s.